When you create a Mailchimp account, we create an audience for you and assign a unique email address to it. The Email Beamer feature allows you to send an email to this address to convert the text and images in the message into a draft email campaign in your Mailchimp account. In this article, you'll learn how to set up and send an email campaign to Mailchimp using the Email Beamer option. When you use Email Beamer, you send your email content to the unique email address for the Mailchimp audience you want to send to. 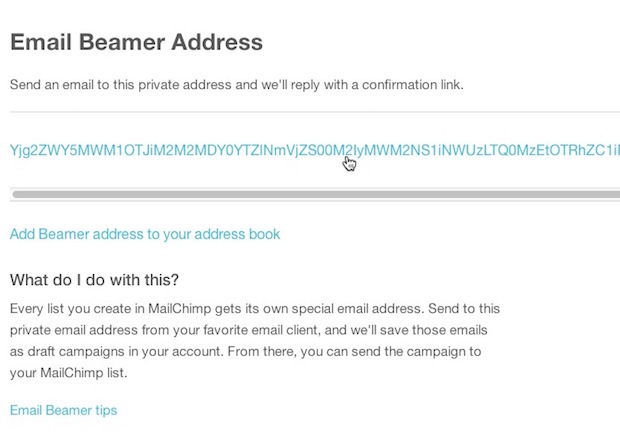 To beam content into Mailchimp, you must send it from a verified email domain. To locate your audience's Email Beamer address, follow these steps. Copy the email address displayed, or click the Add Beamer address to your address book link to download a vcard for the address. Create the email in your favorite email client, like Outlook, Gmail, or Apple Mail. When you create the email, be sure that all images and content are added directly to the body of the email and not as attachments. Once your design is complete, follow these steps. Send the email to the audience-specific email address. The subject line of this email will be used as the subject line for your campaign. You'll receive a confirmation email from Mailchimp Account Services that indicates your campaign has been received and a draft has been created in your account. To send your content as-is, reply to the confirmation email with the word Send, and we'll go ahead and send it to your audience. To make changes or edits to the draft, click the link in the confirmation email or log in to your Mailchimp account and open the campaign from the Campaigns page. Make any changes you want to your campaign settings or design, and then send or schedule your campaign. The email address that you beam from is used as the From email address, and the From name will be the name associated with that email account. These can be changed in the To and From sections of the Campaign Builder. We automatically add our default footer to the code for your campaign to ensure that you have an unsubscribe link and the MonkeyRewards Badge. If you'd like to remove information from this footer, you can do this on the Design step. To avoid accidental campaigns being sent, or the address being hit by spam bots, be sure to keep your audience-specific email address as secret as possible. Don't post it on the web or share it with too many people. Word often adds extra junk code that can create formatting issues. It's best to avoid pasting in content from Word and simply create the email entirely in your email program before you beam it to Mailchimp. 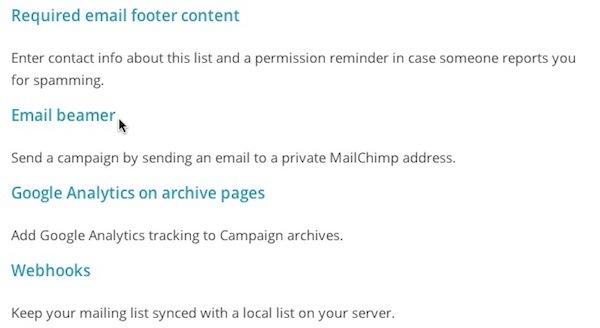 Campaigns sent to Mailchimp via the Email Beamer can be edited prior to sending, but it's not possible to save them as templates for future campaigns.